*All of this information is accurate at the time of us listing it here. Saying that; check USPS's & FedEx's site if you need the 100% most updated shipping information. Free shipping on orders over 500.00 & 600.00 for oversize products. Only applies to the lower 48 states. 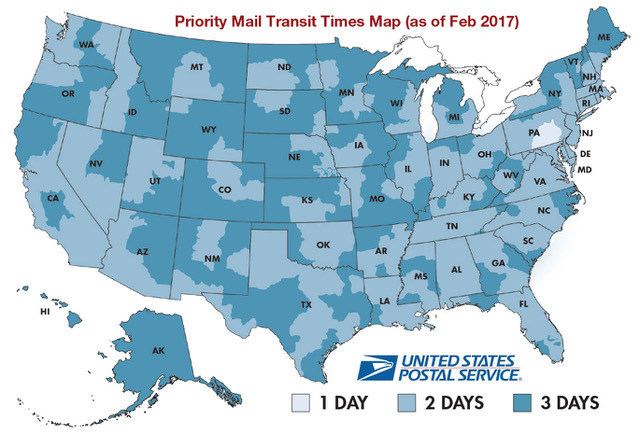 USPS Priority Mail Guidelines & Transit Chart - FASTER & LESS EXPENSIVE SHIPPING for West Coast & International Customers! We have teamed up with the USPS to give faster shipping times to most zip codes at a less expensive pricing structure with a 2-3 day delivery time (Domestic). Priority Mail International is approx 6-10 days but that all depends on your customs and local delivery service. USPS 1st class & Priority Mail are NOT guaranteed services like FedEx. If you have to have a product on a certain day please select FedEx. USPS Ground (Parcel Post) is also available. The chart below is not for that service. USPS Ground is a much slower service, approximately 3-9 days. Only choose this service when you're not in a rush and want a more economical shipping method. For any customers not in the lower 48 states - when ordering larger products you may have to do 2 separate orders so Priority Mail is still an option. For International shipments the buyer is responsible for duties, customs, & brokerage fees (depending on the service you select) and any other taxes that may be applied by your home country. Please contact your local customs authorities to inquire about any fees that may apply. We will NOT falsify or otherwise misrepresent customs documentation in an attempt to avoid customs taxes and fees, we will not falsify the stated value of an item nor claim that an item is a “gift” to avoid any customs and import taxes. Please do not ask. Enjoy less expensive shipping and faster transit times for most packages using USPS Priority Mail/Flat/Regional Rate services. Once again thanks for your business & hopefully this makes your ordering process much more enjoyable! *Shipping days include Monday - Friday (Not Saturday). FedEx home delivery will deliver ground packages to residential addresses on a Saturday, for no extra charge, if that is the date the package is due to be delivered. This chart isn't for Smart Post - that service is a 3-9 day service and is not day guranteed - final delivery is done by the post office. All in stock orders will be shipped within 24 hours the majority of the time. 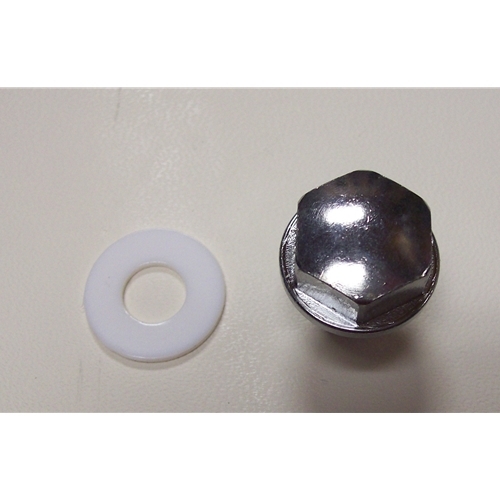 Most in stock new parts, FedEx ground orders placed before 2:00 PM EST, will be shipped the same day. USPS pick up is mid day so orders will have to be in to us either the day before or first thing in the morning. When you qualify for free shipping we will pick the most economical shipping carrier between USPS Priority Mail, FedEx Ground, & sometimes FedEx Smart Post / USPS Ground (Parcel Post). If you refuse a package, you will be charged the return freight. If we are given an incorrect shipping address or if there is a redirect of your package there will be a charge plus any additional fees depending on the service you select. You will need to specify if you want a package shipped with a signature required, if not all residential packages are shipped without a signature required. If you want your package fully insured please notify us at time of ordering. We will not be responsible to cover any costs of damaged / lost products past the amount of insurance that is included per package or the extra insurance you purchase. See #2 in the FAQ page for more information. If a package is damaged notify the driver & call us immediately and leave the package as is, as it will need to be inspected by a FedEx official for insurance purposes. FedEx Air Domestic Shipping Guidelines (all orders need to be placed by 1:00 PM EST to get same day shipping): * shipping days include Monday - Friday - Not Saturday (extra charge) - this is a day & time guaranteed service *some rural zip codes are not guaranteed by the times listed below. 4. Saturday Delivery (only to some zip codes) - this service is only available for Priority Overnight & 2 Day Delivery *Available for an additional fee. 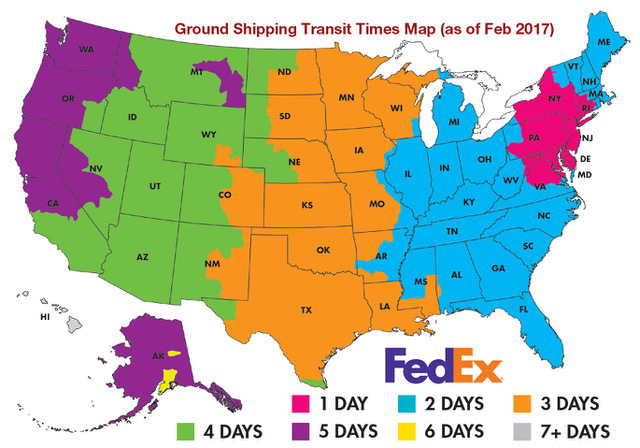 FedEx International Shipping Guidelines (all orders need to be placed by 1:00 PM EST to get same day shipping): *Shipping days include Monday - Friday - Not Saturday (extra charge) - all international times are for general reference only - shipping times vary depending on country & how rural your location is. The buyer is responsible for duties, customs, & brokerage fees (depending on the service you select) and any other taxes that may be applied by your home country. Please contact your local customs authorities to inquire about any fees that may apply. We will NOT falsify or otherwise misrepresent customs documentation in an attempt to avoid customs taxes and fees, we will not falsify the stated value of an item nor claim that an item is a “gift” to avoid any customs and import taxes. Please do not ask.